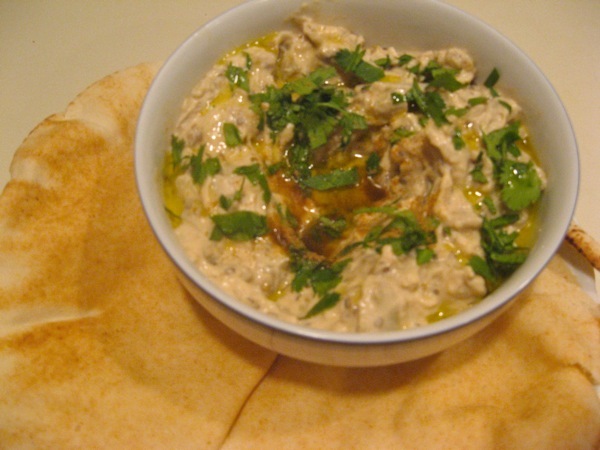 Baba Ghanoush is the simplest recipe and requires no special equipment and very little cooking skill. Plus, except for the half hour you let it sit in the oven, it takes about 5 minutes to prepare. Baba Ghanoush! The great democratizer! You might be asking yourself why you should bother making your own hummus when it is so easy to buy at Trader Joe’s. The answer, which I’m sure you saw coming, is that it is simply a lot better. Homemade hummus will rock your world and still call you the next day. Nope, no three-day rule for homemade hummus! Also, I’m always afraid life or work will take me someplace that does not have a Trader Joe’s, and I want to be self-reliant enough to be able to make my own. I’m pretty sure Ralph Waldo Emerson wrote something about exactly this problem. Both Hummus and Baba Ghanoush require tahini paste, which you may have seen in its watered down version in restaurants as a salad dressing. That’s not a value judgment, by the way, it’s actually watered down when you put it on salad. Anyway, good news is that means that tahini paste, although a specialty item, is available in most larger grocery stores. Sometimes it sits next to the peanut butter–fair, I guess, as it’s basically the sesame seed’s attempt at peanut butter. Sometimes it’s in the ambiguously named “Ethnic” section. For this reason, I recommend asking someone who works there. 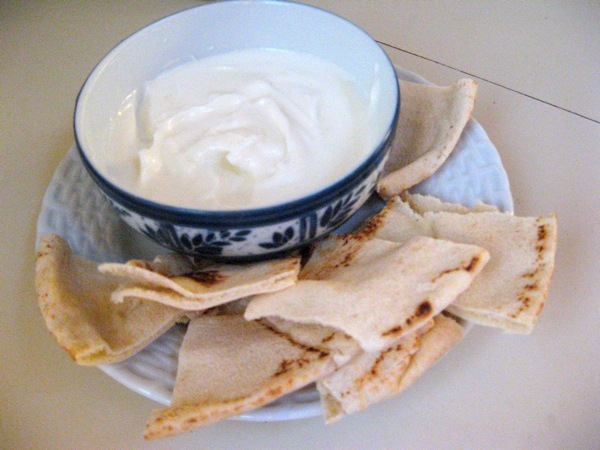 Of these three dips, the Lebanese garlic dip toum is definitely the least well-known stateside. That is something I hope to change, starting now. Toum (literally, “garlic” in Arabic) is a light, airy, and intensely garlicky dip that can be eaten with pita bread, chips, vegetables, or meat–if you make kebabs this summer, you should have it around. I won’t lie, unimpressed parties will likely include people who don’t care for garlic (huge surprise) and those vampires everyone seems so into these days. But if garlic is your jam, toum is like biting into a little, private cloud of Garlic Heaven. America, I trust you’ll make the right choice. Place the chickpeas, lemon juice, and salt in a blender. Process on medium for a minute, or until light and smooth. Put the mixture in a mesh sieve over a bowl. Use a spatula to push the chickpea mixture through into the bowl, leaving the skins of the chickpeas in the sieve to be thrown out. Rinse the blender to remove any skins left behind and return the chickpea puree to the blender. Add garlic, tahini, cumin, coriander, and baking soda and blend until mixed. 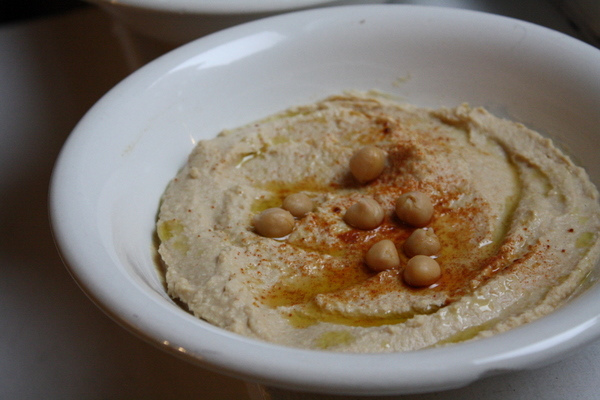 While the blender runs, drizzle the olive oil into the hummus. Add extra salt and lemon to taste. Place in serving bowl. Sprinkle with cumin and drizzle with extra olive oil. Some Baba Ghanoush recipes call for grilled eggplant. It gives a smokier flavor, but I’ve put the cooked version here since more people have access to an oven than a charcoal grill. Feel free to substitute grilled eggplant into this recipe if desired. Note that the safflower oil cannot be substituted with olive oil. Olive oil may be delicious and more likely to be in your kitchen, but it is too heavy and will not allow the texture of the toum to get as light and fluffy as it needs to. Safflower (or sunflower or grapeseed) oil is much lighter, and investing in a bottle only takes a couple bucks and a little planning. I LOVE toum, and this recipe is great! I tried it a few years ago from a lebanese place back home but didn’t know what the “official” name for it was. I just made this tonight and found that neither my blender nor my food pro could get the raw garlic down to a paste consistency, so I opted to use about 3/4 tsp of crushed garlic from Trader Joe’s instead. Not quite as potently garlicy, but it did the trick!